On Saturday, June 6, our on-court workshop will be from 1pm - 4:30on the indoor courts at Western Rockingham YMCA 600 S. 5th Avenue Mayodan, NC 27027 336-427-9622 This facility is within an easy 1 hour drive or the NC Triad Area and southern Virginia. For coaches, parents and instructors who spend most of their time working with children 12 and under. You will be actively engaged on-court by a specially trained and certified national trainer during the On-Court Youth Tennis Workshop. Why is this important? Because our trainers are all PTR and/or USPTA certified and receive special intensive training from the USTA. They will make sure that you have an incredible workshop experience, all at a minimal cost to you. 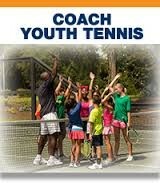 You should complete the 6 session video training on www.coachyouthtennis.com before attending the clinic. Access the video classroom and register for the on-court workshiop at www.coachyouthtennis.com. Registration fee is $15 per person. Extensive coverage of the 10 and Under Tennis play format, including age appropriate play situations and games for 5-6 year olds, 7-8 year olds and 9-10 year olds.